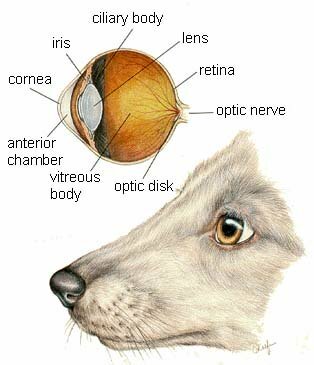 Canine eyes are active organs, they constantly adjust to light which enters into it and which focuses on objects. They produce images which are continuously relayed to brain. The cavity in which the ball is contained, is called the orbit. The orbit is formed by many bones, and also contains various muscles, vessels, nerves and supplementary glands for the creation of tears. The whitish part is called the “sclera”. It is tough and forms most of the outer part of the eye. The sclera is covered by a membrane, called “Conjunctiva”. 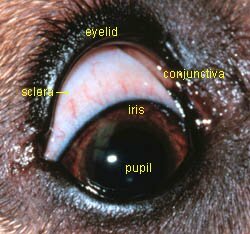 Conjunctiva covers the white part and ranges from the edges of the cornea to the inner parts of the canine eyelids. The cornea is in the front, and which acts as a pathway for light to enter. It is a domed like transparent layer, which not only protects, but also helps in focusing light over the retina. The iris is the colored area, which controls the amount of light that enters. This part is connected with the pupil, which is the blackish part in the middle of the eye, that contracts or relaxes according to the amount of light. The lens are located behind the iris, and focus the light onto the retina. Function is controlled by the sphincter and ciliary muscles, which end up controlling the amount of light entering into the eye and focusing nearer and far objects over the retina. The retina is the layer of special cells, which are called photo receptors. The central part of the retina has excessive photo receptors as compared to other animals. This part is called the area centralis, and thus dogs can see relatively sharper visual images as compared to humans. Each photo receptor in the retina is connected to a nerve fiber, which collectively forms the optic nerve, which carries the images in the form of electrical impulses to the brain. Photo receptors have the ability to convert visual images into electrical impulses. Along with the aforementioned vital parts, there are other supplementary parts which perform important functions. Eyelids are folds of skin which protects and keeps the surface of the eye moist through reflexive blinking. Along with the eyelids, nictitating membranes also perform a protective function, and in general are called third eyelids. A canine third eyelid protects the inner surface of the front of the eye, during crucial times, such as when there is inflammation or during excessive environmental stress in the form of dust or debris. Lacrimal glands and mucus glands produce watery and mucus parts of dog tears respectively, which are meant for keeping the eyes moist and allows them to function properly. 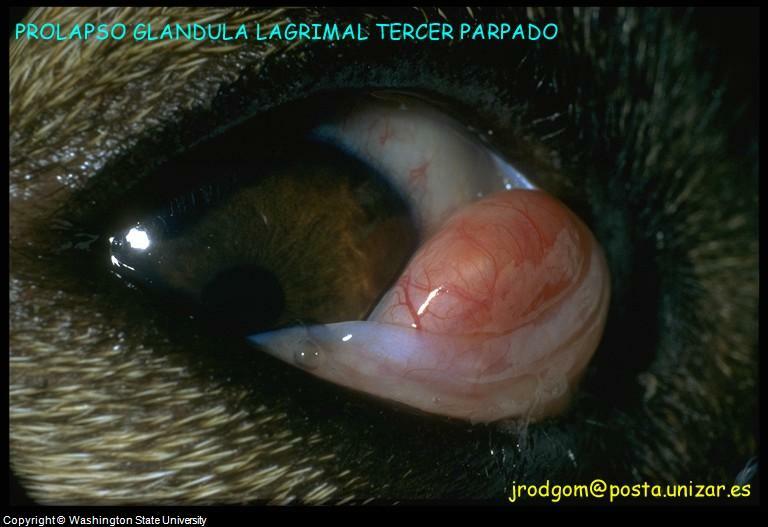 Both of these glands are located on the top, outer edge of the dog eyes. Tears in their original form are watery in nature, but mucus is added to prevent early evaporation. Tears are drained into the nose and inner edge of the eye, through the nasolacrimal ducts. Canine eyes are delicate but durable. They contain various complicated parts and researchers believe that for the most part, the most energy is consumed by the brain in the canine body, while most brain energy is consumed by the eyes for their normal functions, because of the heavy nerve supply and overall functionality. It is believed that most eye problems in dogs are secondary to some other systemic disorders, e.g. most dog eye infections are caused by problems in the nose and unhygienic conditions over the area surrounding the eyes such as the face and eyelids. Similarly, most eye tumors are metastatic in nature, only a few are primary in nature. Clinical symptoms such as redness, inflammation, sensitivity to light, puffiness and discharge are a few of the clinical indications of disease. 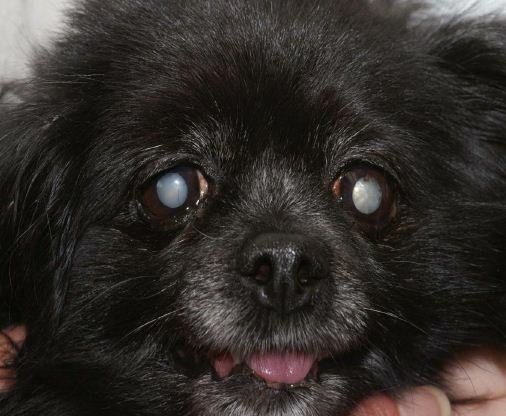 Dog Cataracts: Canine cataracts refers to problems with the dog eye lens. The condition in dogs is congenital (inherited). Several breeds have a higher incidence of this dog eye problem including Poodles, Labrador Retrievers, Terriers, Cocker Spaniels, Husky, Golden Retriever and Schnauzers. The problem in Golden and Labrador Retrievers often remains small, while in other dogs the disease could lead to blindness. Dogs with cataracts often have an allergic reaction to the cataract in the eye only, which results in symptoms such as canine glaucoma and possible scars. Surgery is the treatment approach for cataracts in dogs. An owner must administer eye drops for 6 weeks after the cataracts surgery is performed. Some Veterinary Ophthalmologists recommend the replacement of the eye lens after surgery to help sharpen a dog's vision. There have been recent advances in topical medications for dog cataracts that are the result of diabetes. Ask your veterinarian about the medication Kinostat. Natural products for canine cataracts, specifically Ocluvet, will not harm the eye, but are not a cure. At best, it is a supportive therapy to be used along with conventional approaches to treatment. Dog Pink Eye: One of the most common dog eye problems is dog pink eye (canine conjunctivitis). This condition is often caused by a food allergy, environmental factors such as allergens or dust, or infectious agents e.g. ; bacteria and fungi. Often, the condition starts due to an allergy, but from rubbing the head against a hard object to get some relief, infection could set in. In general, allergy affects only one eye, while infection is seen in both eyes. Treatment involves a flushing of the eye, and the possible use of antibiotics for any infection. Dog Dry Eye: Another common dog eye problem is dog dry eye (also called keratoconjunctivitis sicca, KCS or Canine Dry Eye Syndrome). The problem is caused by autoimmune disorders, certain medications, injury and in some cases, it is an inherited condition. Treatment usually includes the use of the prescription medications antibiotics and corticosteroids. 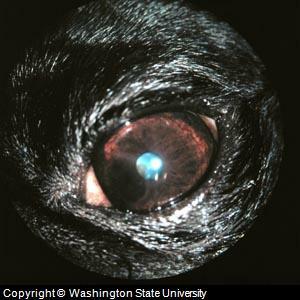 Dog glaucoma describes a condition where there is high pressure (IOPO or intraoccular pressure) on the optic nerve. If the canine galucoma isn't treated, it can result in damage to the nerve, and ultimately lead to blind spots, tunnel vision and blindness. 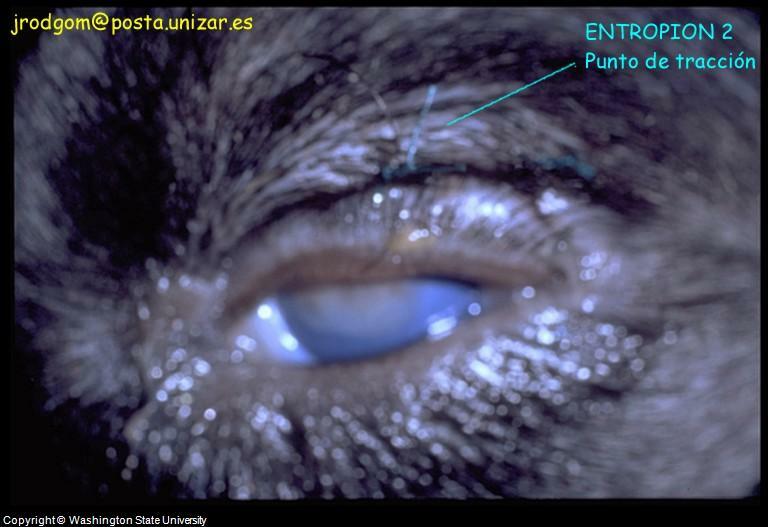 Canine Eyelid Luxation (also proptosis): This condition refers to canine eye problems where the eye is dislocated forward and behind the eyelid. Treatment involves pulling on the eyelid and moving the eye back into place. 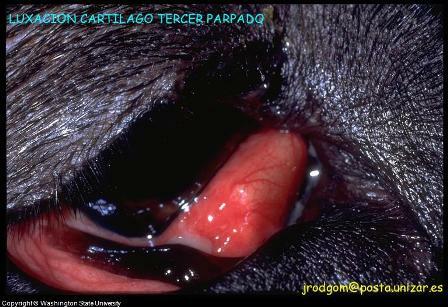 Dog Eye Prolapse: This problem usually occurs after trauma or an injury. It is the protrusion of the iris through a wound in the cornea. 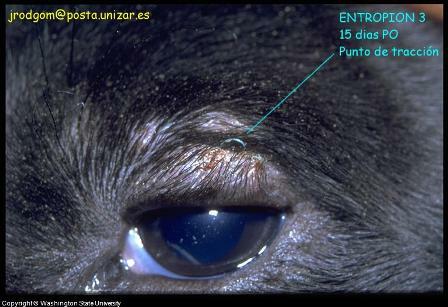 Canine Eye Entropion: This condition occurs when the margin of the eyelid folds inward. 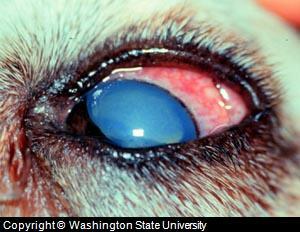 Canine Eye Irritation: This picture shows pigment on the cornea as a result on mild irritation. Ulcerative Keratitis: This dog eye condition refers to inflammation of the cornea and increased blood flow to the eye (hypermia). 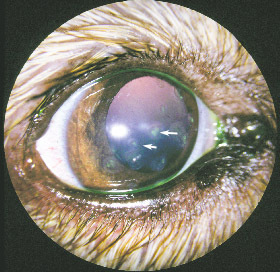 The condition also resulted in what are opacites (dog cloudy eye). Different approaches have been practiced for treating canine eye problems. As these are delicate organs, canine eye medicines are usually specially formulated in form of canine antibiotic eye drops, ointments, creams etc. Similarly, for examination and operations, special medical equipment has been designed for this purpose. 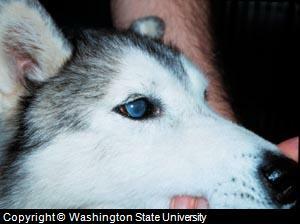 Canine eye surgery is used when other approaches are not viable. Dog eye surgery is used for various canine eye conditions including cataracts, eye excision, eyelid tumors and when correcting any anatomical deformities. Surgery is also used when an eyeball needs to be removed, a procedure called canine eye enucleation. Routine eye care, observation and cleaning of the surrounding areas is a necessary part of maintaining the health and normal functioning of the eyes. If owners take proper care of the canine eyes at home through regular cleaning with isotonic eye wash solutions that come in a drop form such as Opticlear and by taking timely action on even minor issues, an owner can prevent most canine eye problems a dog can face in its lifetime. Natural remedies such as EyeHeal are one of most appropriate options for routine eye care and support during canine eye problems. These are safe and effective, and usually do not have most common side effects or issues related to commonly prescribed therapeutics. Other natural remedies is as i-Clenz are safe for cleaning around the eye, such as when removing dog tear stains. See this page for step by step instructions on how to administer ointments and drops.